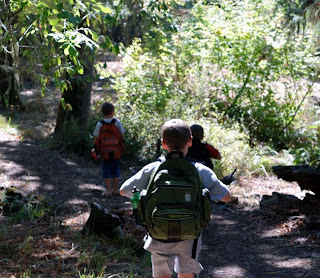 First day of school: Journals in backpacks, pack a lunch, ditch the books and get outside for an Explore, an expotition. 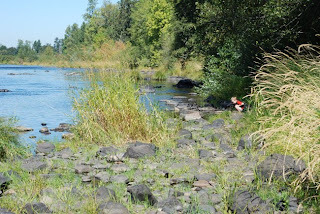 It was a beautiful day for a trip to the river. Sunny and warm. Bit of a breeze. Dragonflies and minnows and a scolding Steller's jay. The pear orchard is on the way to the river. 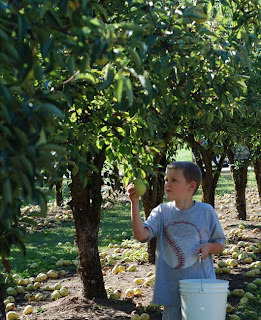 We picked pears. Perfect. 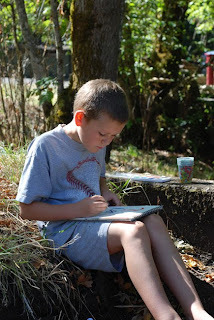 Third-grade gent was so excited to break out his new paints that he skipped lunch to paint in the dry creek. There's something absolutely delightful and satisfying about that kind of enthusiasm. Down the trail they go! It's been a while since we had a full-blown nature outing. The fine young gents were thrilled to be hiking in a favorite place, eager to follow their feet. First-grade gent. Look at that smile! He loves collecting things. Mount Pisgah is mostly oak savannah, with many varieties of oak trees. 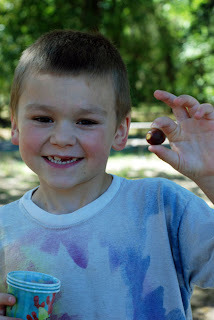 He collected acorns. 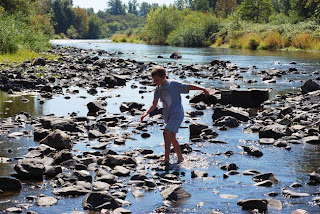 The fine young gents found a new place along the river with many rocks. They spent nearly an hour re-engineering a rock dam built by a previous visitor. Bonus: One of the fine young gents chose bridge-building for a fall study, so we all got a hands-on head start on the Bridges unit. 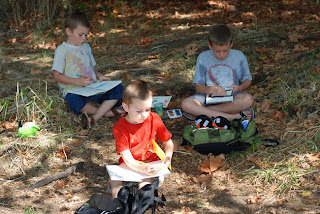 After a grand time splashing in the river, we all settled down with nature journals. Writing, handwriting, spelling, science, nature and art all rolled into one. And we're out-of-doors. Perfect. I'm going to print this picture and post it on the refrigerator. This is why we homeschool.